60 | TH E M R EP O RT O R I G I NAT I O N S E R V I C I N G A NA LY T I C S S E C O N DA R Y M A R K E T SECONDARY MARKET SECONDARY MARKET THE LATEST Fannie Mae Completes Two Credit Insurance Risk Transfers The CIRTs include $14.4 billion in single-family loans. 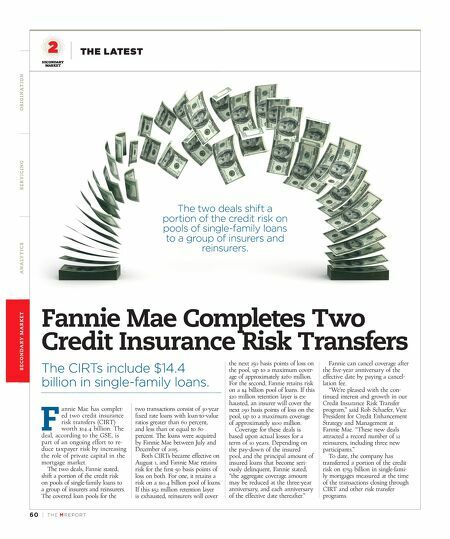 F annie Mae has complet- ed two credit insurance risk transfers (CIRT) worth $14.4 billion. The deal, according to the GSE, is part of an ongoing effort to re- duce taxpayer risk by increasing the role of private capital in the mortgage market. The two deals, Fannie stated, shift a portion of the credit risk on pools of single-family loans to a group of insurers and reinsurers. The covered loan pools for the two transactions consist of 30-year fixed rate loans with loan-to-value ratios greater than 60 percent, and less than or equal to 80 percent. The loans were acquired by Fannie Mae between July and December of 2015. Both CIRTs became effective on August 1, and Fannie Mae retains risk for the first 50 basis points of loss on both. For one, it retains a risk on a $10.4 billion pool of loans. If this $52 million retention layer is exhausted, reinsurers will cover the next 250 basis points of loss on the pool, up to a maximum cover - age of approximately $260 million. For the second, Fannie retains risk on a $4 billion pool of loans. If this $20 million retention layer is ex- hausted, an insurer will cover the next 250 basis points of loss on the pool, up to a maximum coverage of approximately $100 million. Coverage for these deals is based upon actual losses for a term of 10 years. Depending on the pay-down of the insured pool, and the principal amount of insured loans that become seri- ously delinquent, Fannie stated, "the aggregate coverage amount may be reduced at the three-year anniversary, and each anniversary of the effective date thereafter." Fannie can cancel coverage after the five-year anniversary of the effective date by paying a cancel- lation fee. "We're pleased with the con- tinued interest and growth in our Credit Insurance Risk Transfer program," said Rob Schaefer, Vice President for Credit Enhancement Strategy and Management at Fannie Mae. "These new deals attracted a record number of 12 reinsurers, including three new participants." To date, the company has transferred a portion of the credit risk on $759 billion in single-fami - ly mortgages measured at the time of the transactions closing through CIRT and other risk transfer programs. The two deals shift a portion of the credit risk on pools of single-family loans to a group of insurers and reinsurers.